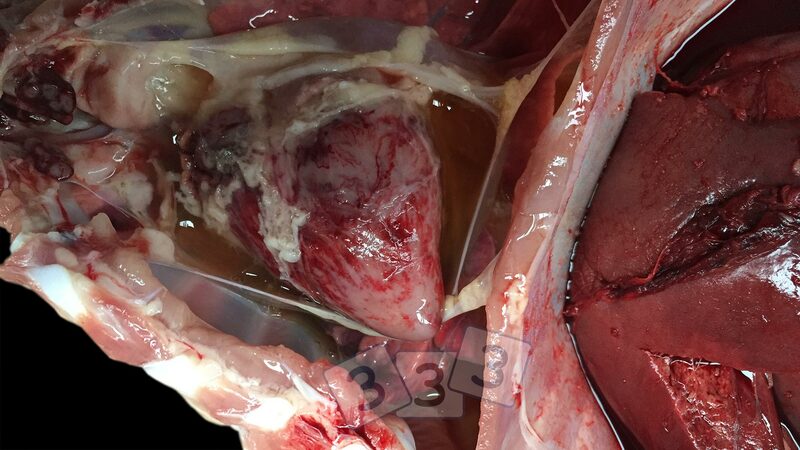 Case of mulberry heart disease in 6 – 8 weeks old weaner pigs with sudden deaths. The levels of vitamin E in the diet of these pigs were 50 mg/kg instead of the recommended 250 mg/kg at weaning and 150 mg/kg four weeks later. Vitamin E is necessary for the optimum function and metabolism of the muscular, nervous, circulatory and immune systems of the pig. The major clinical signs of this complex deficiency appear to result from the effects on energy metabolism. The most severely affected cells in the pig are hepatocytes and muscle cells in the heart and skeletal muscle. The syndrome develops as a result of congestive heart failure, coupled with hydropericardium.